A steady flow of insurance leads at one low fixed monthly cost. 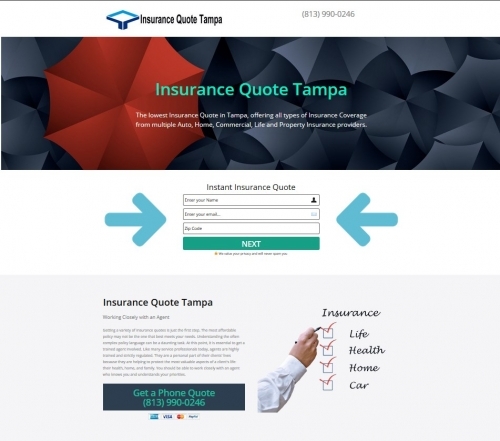 We completely customize this insurance lead generating website for your agency. NOTE: You can use this website as your main website (if you do not have one) or as a stand alone lead generator to compliment you existing website. Full functioning lead generator form leads go directly to you! Full functioning seasoned insurance lead generator for the greater Tampa Bay area. This is a premium domain name that is highly searched on Google and search engines for those looking to obtain an insurance quote in Tampa. This lead generator is pre-optimized and comes with a full functioning step by step form that can be customized for your particular needs as part of the setup fee. This website has a complete, easy to edit back-end that allows you to add, edit or change content with simple editing tools. Complete instructional video is included in the purchase, as well as unlimited live support and ongoing updates and optimization as part of the monthly fee.